If you are in the mood for something spicy and different, this satay is for you! I have been making this for years and I just love the peppery flavor of this "ketchup"! I love the intoxicating smell of freshly ground pepper and use freshly ground pepper every time I can! The Indonesian ketchup also boasts the flavors of nutmeg and fresh ginger to ramp up the flavor a bit. I am playing along with Jenny Matlock for Alphabe-Thursday where the letter of the week is "S" for Satay. 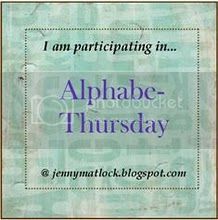 I encourage you to visit her Alphabet Party where you will be treated to fun and informative "S" posts this week. Unfortunately, I can not credit this recipe. It is one of those recipes that I just clipped from a newspaper or magazine and the clipping doesn't contain the original source. Combine all ingredients in medium saucepan. Bring to a boil; reduce heat and simmer, stirring frequently, until slightly thickened, about 7 to 10 minutes. This sauce can be made ahead (up to 2 weeks). Cover and refrigerate. Makes about 1-1/4 cups. Cut chicken breasts into bite-sized chunks. Combine water, lime juice, soy sauce, chiles, and black pepper in medium bowl and add chicken and toss to coat. Cover and refrigerate 3 to 4 hours, stirring once or twice. Prepare grill. Remove chicken from marinade and thread on skewers. 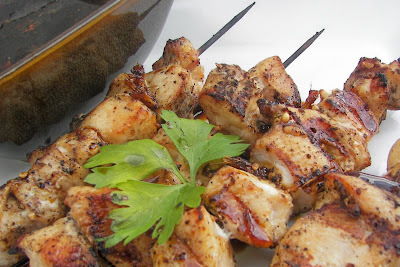 We ususally thread about six pieces of chicken on each skewer. Grill until cooked through and browned. Just before removing from grill, brush lightly with the Indonesian ketchup. Serve with additional Ketchup for dipping. Serves about six. 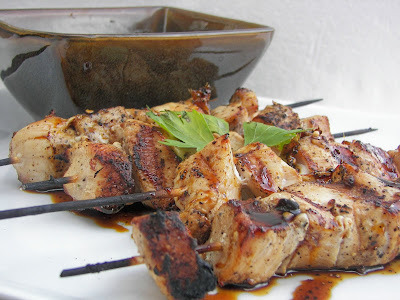 Note: Soaking the skewers in water for about 1/2 hour before barbecuing can help so that the skewers don't burn so much. When we made these recently, we didn't brush the skewers with Ketchup while they were on the grill. We just served the ketchup as a dipping sauce. Some of my children are not fans of the ketchup; others are. 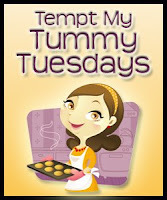 Beauty and Bedlam's Tasty Tuesday. All the Small Stuff's Tuesdays at the Table. We lived for years on the Dutch border, and one of our favorite restaurant meals was Indonesian Ristaffel - and satay. Your recipe for the sauce is different from mine, so I'll definitely be trying it. It's nice to put a new twist (for our taste buds!) on an old favorite. Sounds really good--thanks for sharing! This looks delicious! Looks like the perfect recipe for breaking out the BBQ this summer!! What sides do you normally serve with it? You did a beautiful job posting this. I really enjoy satay. The catsup sounds wonderful. The meat looking so yummy. I am a lover of Indonesia food and its spiciness....and I like sambal on most anything ( except dessert! ). Satay is wonderful and I will have to try your recipe. I also like nasi garang and many of the other excellent dish. San Francisco, fortunately, has a couple of restaurants. My poetry book - Life's Journey by Carmen Henesy - is out on Amazon!! Finally, at the age of 65, I did it! When I saw satay my mouth watered. Your dipping sauce sounds so different then my peanut based one that I will definitely give it a try! This is one of my absolutely favorite foods...served with a side of soba noodle salad and a fresh leaf lettuce salad dressed in soy, peanut butter, sesame oil and ginger. Thank you for this scrumptious post on our little journey through Alphabe-Thursday's letter "S"! And please bring me some leftovers tomorrow! At first I thought, nah, I don't think I like satay. But wow, you changed my mind. Great recipe and thanks for sharing it on S day. I've never heard of Indonesian Ketchup but it looks excellent! I'm printing this recipe out and hope to try it soon, thanks! okay, you are totally speaking my language here ... i'm going to be making these very very soon. Thanks for posting the recipe!!! go S!!! Superb S post, I'm marking this recipe to try very, very soon! this looks spectacular! i am definitely going to try it...yum, yum, yum! I was looking for a way to serve chicken tomorrow - now I have it! Yum!